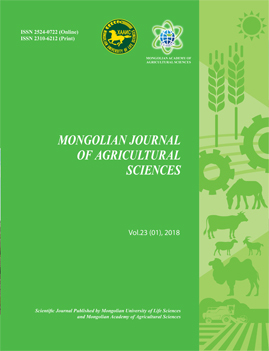 Of all reported distributions of weeds of 19 species belonging to 15 genera of 10 families in the wheat planted fields Tsagaannuur soum of Selenge aimag, annuals account for 57.9%, biennials for 10.5% and perennials for 31.5%. The use of herbicide Trimexa, Cliomex 300, Cliodmex plus and Trimexa + Cliodimex plus express for controlling both grassy and dicotyledonous weeds has Agropyron repens L, Panicium miliaceum L, Eragrostis minor Host, Amaranthus retroflexus L, Artemisia sieversiana Willd, Cannabis ruderalis Janisch, Chenopodium album L, Chenopodium aristatum L, Chenopodium acuminatum Willd, Convolvulus arvensis L, Convolvulus gortschakovii Schrenk, Erodium stephanianum Willd, Polygonum convolvulus L, Geranium siviricum L, Salsola collina (Pall), Salsola australis R.Br, Noneo pulla L, Malva mohileviensis Downer, Vicia cracca L. 84.4-90.9% technical effectiveness. that the manuscript or parts thereof will thus not be published elsewhere in any language without the consent of the copyright holder. Copyrights include electronic and visual reproduction and distribution; electronic storage and retrieval; and all other forms of publication or any other types of publication including all subsidiary rights.